The U.S$10 million bridge was constructed with support of the Japanese International Cooperation Agency (JICA) and it will last 120 years. 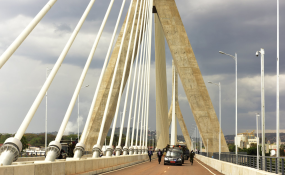 President Museveni and Mr Masahisa Sato, the State Foreign Affairs Minister of Japan, will today gather in Jinja to officially open the new iconic cable stay bridge over River Nile expected to last for 120 years. The government of Japan fully bankrolled the construction at Shs313b of the overpass, which provides a safer crossing to substitute the decaying Owen Falls Dam Bridge, about 500 metres north. Some 800 employees, almost nine out of every 10 being Ugandans, built the infrastructure over four years. Official records show that more than 50 engineering students gained hands-on skills as interns working on the project that employed engineers, expatriates, crushers and labourers from across Uganda. "I'm happy the work is done," said Eng Lawrence Pario, who as the contractor manager was responsible for overall coordination, supervision and management of the project. He added: "We did best quality assurance and rigorous quality control and tested the construction materials with state-of-the-art equipment, both within and abroad in Singapore and Japan. It (bridge) is an excellent piece of engineering." Zenitaka Corporation and Hyundai Engineering and Construction Company from Japan and South Korea, respectively, erected the overpass formally named The Source of Nile Bridge for its proximity to the upstream point where River Nile flows out of Lake Victoria. It is planned to be adorned with Uganda, Japan and Uganda National Roads Authority (Unra) flags during today's ceremony and afterward to symbolise the partnership between the trio. The signature beauty of the gigantic concrete and steel structure is 72 harp-like white cables connecting the bridge deck to two 69-metre tall inverted-Y pylon towers. According to Dr Hiroshi Akiyama, a Zenitaka engineer, the stay cables hold and hang the girder and support both human and vehicle traffic weight. The super-structure is protected against lightning with lightning arrestors, which run from the deck to each tip of the inverted-Y pylon towers. Transport Minister Monica Azuba, during an on-spot inspection last Friday, marveled at was she called an architectural and engineering wonder. Unlike Entebbe expressway, another flagship infrastructure project that motorists will be billed to use, Ms Azuba said there will be no toll on users of the new bridge. The minister said the government is assessing the nature and extent of damage of the old bridge astride Owen Falls Dam, renamed Nalubaale Dam, which for now will be "used by pedestrians, motorcyclists and bicycle [riders]". At a press conference in Kampala yesterday, the Unra director for Roads and Bridges, Mr Samuel Muhoozi, said the new bridge will spur Uganda's economic integration, facilitate its integration with regional neighbours, provide safer travel and enhance tourism. As Ugandans and other travellers prepare to use the bridge, following a successful test runs, fishermen delayed by its construction are counting losses as will businesses located along the old bridge. The government began talks with Work Bank in 2004 to fund the project. The bank produced a pre-investment study report in March 2016. The International Development Institute carried out another pre-investment study and submitted its to Uganda government in July 2007. Japan International Cooperation Agency (JICA) conducted feasibility study in 2008/9 and did detailed designs in 2009/2012. The project contractor and supervision consultant were procured a year later. Actual construction of the bridge started in April 2014 and was completed four years later, leading to today's commissioning by President Museveni and Japan's State Minster for Foreign Affairs, Mr Masahisa Sato. There are 202 Light-Emitting Diodes (LED) bulbs at the base of the cables, but with the meridian of the deck, that light up the 72 stay cables. A trial illumination was conducted on Monday night to the wonderment of residents and passerby, and is billed to be a huge tourist attraction. Officials say the iconic overpass will only be illuminated during national ceremonies through a computerised lighting system. A new 0.8 kilometre road has been constructed from the Nile Breweries plant round-about, linking to the bridge and onto a new 1-kilometre surfaced stretch that connects back to the old highway at Igar fuel station junction. All motorised traffic, Transport Minister Monica Azuba said, will be diverted onto this new road, leaving the old one via Nalubaale dam for use by "boda bodas". Jinja highway offers import-export gateway for Uganda through Kenya. There are two, about half-a-kilomtre from each edge of the bridge. It is fitted with four cameras, two each on dual carriageway. One of camera on each side takes the photograph of every approaching vehicle, while a truck measured in motion to be overloaded will automatically trigger the second camera to photograph the number plate of the car. The data is transmitted to Uganda National Roads Authority (Unra) central information system for enforcement. The government has paid out Shs16.6b in compensation for forty-one out of 49 claims, Eng Samuel Muhoozi, the director for Roads and Bridges at Unra told a press conference yesterday. Our investigations show that the eight claims remain unsettled due to dispute over compensation amounts. Ms Halima Bin Salim, the chairperson of Nalufenya B where the infrastructure I located, declined to discuss the matter.